Our wastewater treatment plants each have an Ohio EPA discharge permit that limits of the amount of mercury we can discharge. 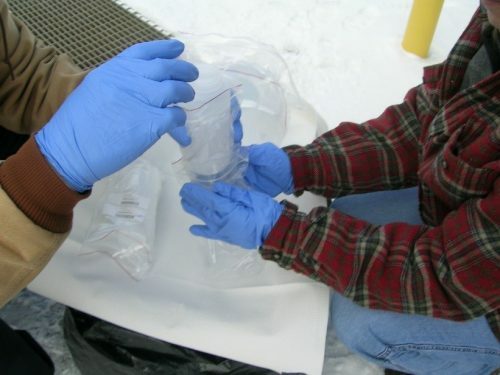 Our Water Quality and Industrial Surveillance (WQIS) Department administers the Mercury Reduction Program. The Ohio EPA has given us authority to regulate non-domestic sources that may be discharging mercury into the sewer. Using the most sensitive analytical methods, mercury can be detected in virtually all sources of water in the sewer system. 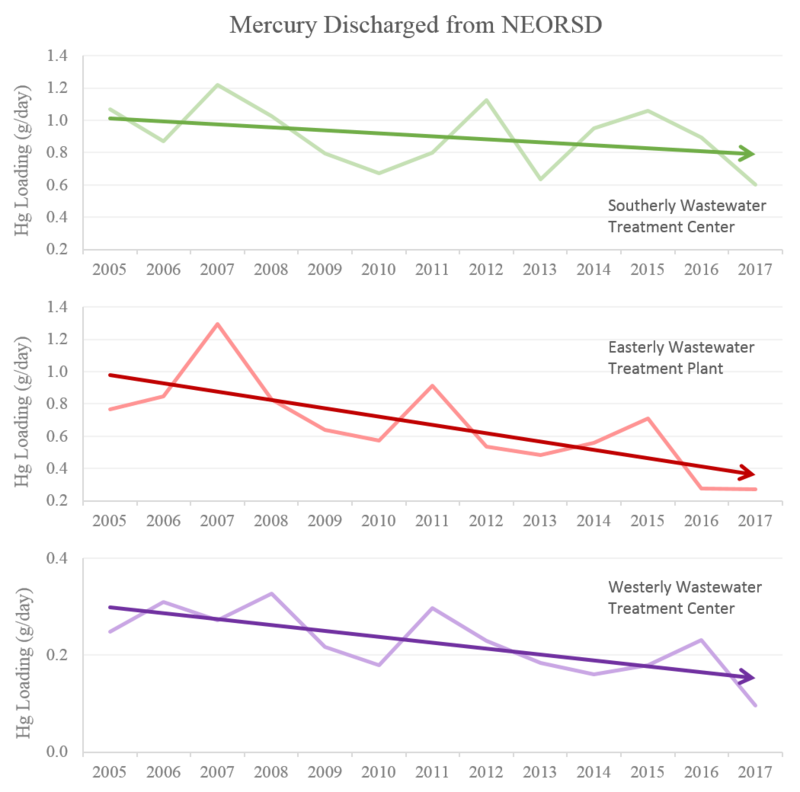 For this reason, we enforce a requirement that all sources of mercury, including dental facilities, local industries, hospitals, and others, implement Best Management Practices (BMPs) to minimize the amount of mercury discharged. BMPs are geared towards preventing pollutants from reaching the sewer system and eventually our waterways. BMPs typically are industry specific and are developed after research and testing. Our Investigators also serve as emergency responders for mercury-related spills within the District’s service area. The Easterly Wastewater Treatment Plant and Westerly Wastewater Treatment Center discharge to Lake Erie, and the Southerly Wastewater Treatment Center discharges to the Cuyahoga River. Since 2005, WQIS has been sampling the discharge from these facilities twice a month to ensure the mercury levels meet EPA limits. 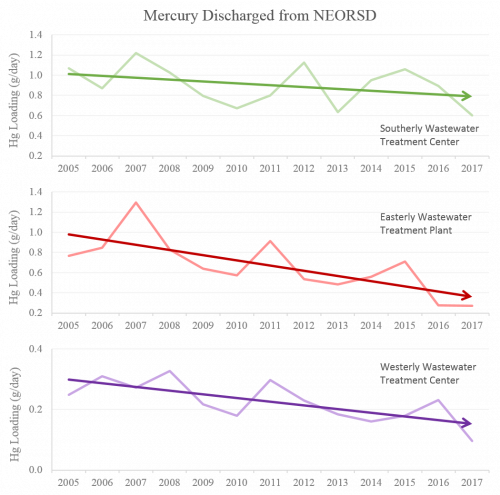 As shown in the diagram below, the mercury levels in our discharge have been decreasing. This is a positive sign that our efforts are working. In addition to sampling regularly at the plants, WQIS has completed and continues to conduct study projects which aim to locate, identify, and where cost-effective, reduce levels of mercury contributing to our effluent levels. The projects are conducted at our wastewater treatment plants and within our collection system. WQIS conducts inspections at industrial users, dental facilities, and hospitals to investigate if they contribute mercury to the sewer system. Those industries which have been issued BMPs are inspected to ensure that they are being implemented correctly. If you are a dental practitioner or dental office, hospital, or industrial facility with questions about our Mercury Program, please contact us at any time at mercuryprogram@neorsd.org or at 216-641-6000.